The LG Watch Style isn't an all-singing, all-dancing smartwatch, but it does its job and it does it well. If you're after a smartwatch that looks like a premium, fashionable watch, this isn't the device for you, but if you want a smartwatch that's comfortable, fuss-free and easy to use, the Watch Style is well-worth considering. 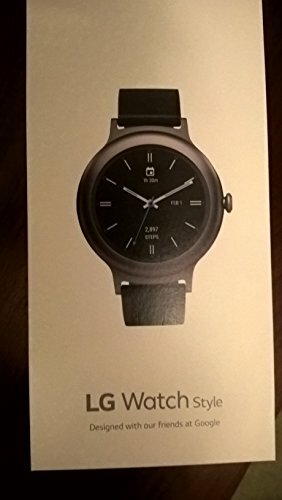 When the LG Watch Style was announced in February 2017, it was one of the only Android Wear 2.0 watches, which gave it a notable point of interest. Six months on, however, at the point of its release, it faces some tough competition from the likes of Huawei, Tag Heuer and Montblanc – all of which are gunning for some of the AW2.0 smartwatch pie. Unlike the higher-spec and rugged LG Watch Sport version – which we're yet to hear when or even if it will grace us with its presence – the Watch Style is simple and subtle in its approach, unlike the better built, tougher and bulkier competition. Does the LG Watch Style succeed in its endeavours? Or is it too simple to make it as enticing an option as those watches from the established fashion and watch brands? The LG Watch Style is the slimmer of LG's two Android Wear 2.0 watches. The Watch Sport is chunky and rugged, while the Style is the sleeker of the two, offering a slim build at just under 11mm. The watch body is stainless steel, while the back is plastic, though it doesn't feel cheap like the LG Watch Urbane. It doesn't have as much to look at as the likes of the Tag Heuer Modular 45 and the materials don't look or feel as premium as the Montblanc Summit, but these devices are significantly more expensive. We're talking at least three times the price. The LG Watch Style is light – a little too light if you're seeking a true watch-like experience – which could be seen as one of its biggest attributes, as it's easy to forget it's even on the wrist. It's comfortable to wear and it looks good on a smaller arm – something that can't necessarily be said for the Montblanc or the Tag, depending on your style preference. The Watch Style comes in three colourways, each of which has an IP68 water and dust resistance rating. We had the titanium model in for review which comes with a black leather strap, but we prefer the rose gold model we initially saw back in February. The rose gold appears to have a little bit more to it, with less risk of being mistaken for a toy watch – like this titanium model on review occasionally did. Which is a notable point: even though the Watch Style ticks the metal box for its use of titanium, it goes to show that materials not finished in a certain way can present themselves unfavourably. We've had colleagues handle the Style who thought it was a plastic watch. There's only so much a leather strap can negate that perception. The straps on the Watch Style are easily changed, requiring a simple pull back of the pins positioned on the underside of the device and unhooking the strap. We'd therefore probably choose the rose gold model and change the strap, or add a more exciting strap to the titanium model to give it a bit more style, as its name supposedly suggests. There is one central rotatable crown on the right of the Watch Style's watch face, rather than the three on the Watch Sport. The bezel surrounding the display is narrower than the Sport's, too, and shiny for a smarter finish. The Style's crown is very responsive and easy to use, sliding through the menu options quickly and easily with no lag, which is one of Android Wear 2.0's premier features – and a feature which the Huawei Watch 2 lacks. The LG Watch Style offers a smaller 1.2-inch OLED display, compared to the 1.38-inch display on the Watch Sport, which offers crisp text thanks to its decent resolution. When set to automatic brightness it isn't as punchy as some OLED screens we have seen, such as that of the Apple Watch 2. Jump it up to full brightness in the settings, however, and you'll be greeted with a super vibrant display that's packed full of rich colours. It's not really necessary to do, especially as the battery life will take a hit, and the automatic brightness setting manages just fine, but it delivers a nice boost if you fancy it. The biggest take-away of the Style's screen is that there's no 'flat tyre' - the cut-away black bar to the bottom of the screen, as in some older smartwatches - like there is on the Moto 360 and Michael Kors Access. That's a great thing, ensuring a fully circular display for a more genuine watch-like appearance. The screen is touch-sensitive, which is one way to control Android Wear 2.0, but we preferred to use the crown for control to keep the screen free of fingerprints. LG Watch Sport vs LG Watch Style: What's the difference? The LG Watch Style runs on Qualcomm's Wear 2100 platform, just like the Watch Sport, but it has less RAM and a lower capacity battery. Despite the reduction in RAM, operation is smooth and fluid, with no stuttering experienced as we were switching between various features and functions. Notifications were occasionally a little slow to come through, however. Battery life isn't the best going: the Style would get us through a working day but very rarely through a full night too. It means you have to charge the Watch Style every night and sometimes mid-afternoon, especially if you want to wear it out for a late night. This is something we came to expect from smartwatches in the past, but there are a couple that last a bit longer than 24 hours these days, like the Huawei Watch 2 Sport. Fortunately charging the Style is simple. It's a case of attaching the watch to a circular disc charger, without any fuss, and a full charge takes a couple of hours at the plug. As we mentioned, the Watch Style misses out on a few other features present on the Watch Sport, including LTE connectivity, NFC, GPS and heart rate monitoring, hence why we expected a slightly better battery life. While this means the Style is significantly slimmer in design than many others, it also essentially means it's a much dumber smartwatch than the Sport model and many of its competitors. The Watch Style is therefore pretty much as basic as smartwatches come in terms of functionality, relying on its slender design and fluid performance to see it through. The LG Watch Style was first announced at the same time Google released Android Wear 2.0, designed to show off the new features of the updated wearable platform, though the software is now available on the majority of recent wearable devices. Android Wear 2.0 is a significant improvement compared to the previous iteration, offering more independence, with users being able to install apps directly onto a watch. In short, the second-generation of Wear no longer feels like the software is the weak link – which is something we said of some earlier smartwatches. The rotational control on the Watch Style is great too. Pressing it once opens the app menu and presents round icons around the display. Rotating the crown will then scroll through these (you can favourite apps to keep them at the top of the list) to make it easy to access your most used apps – it's much more dynamic than the old flat list. A long press of the crown launches Google Assistant, where you can ask for help with various tasks, such as directions or your agenda. It's not perfect all the time, but it works well enough and its a useful feature to have. To switch watch faces is easy, with a swipe of the screen, much like you can on Apple Watch. Complications have also been added, allowing you to customise watch faces with various elements you want to see (or not), such as step count, weather, the date, and so forth. There is also a new quick settings shade for instant actions, while the Google Fit app has also been significantly improved, though the Watch Sport is the more suitable device to give you a better idea of your activity progress. The LG Watch Style is a simple but effective smartwatch with good overall performance and a great software experience. That said, it doesn't offer the same premium appeal as others in its field. It lacks thrills in terms of features – especially when compared to the LG Watch Sport and others – and doesn't have a particularly good battery life, which is further compounded considering its limited feature set. Style is its name, but it's not the most stylish smartwatch out there either, with several others far beyond in terms of fashion, design and use of materials. But what the Watch Style does offer is simplicity which, for some, will make it a perfect first smartwatch. If you're after a smartwatch that looks like a premium, fashionable watch, then the Watch Style isn't the device for you. But if you want a smartwatch that's comfortable to wear and easy to use, then this LG offering does Android Wear 2.0 justice. We just wish it lasted longer. The Huawei Watch 2 Sport is significantly chunkier than the dainty LG Watch Style but it is more accomplished, offering great independent control if you opt for the 4G version, as well as a well-built design with top-spec hardware. It's a good alternative in the same price bracket, with a few extra features, such as two-day battery life and heart rate monitoring. The Tag Heuer Connected Modular 45 is the smartwatch fashion king. If its style you are after, the Tag has it all, though it does come at a very hefty price tag (excuse the pun) compared to the LG Watch Style. There will be no mistaking this smartwatch for a toy though and although it lacks a rotational dial, the Connected Modular 45 drips in quality and offers plenty of customisation options.